to discover some of the most famous race-tracks in the world. 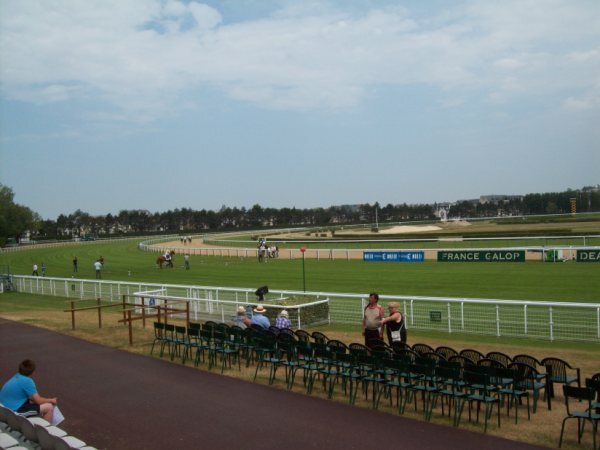 My first visit to a race-track outside the UK was made to Deauville-La Touques Racecourse, Normandy, France home to some of the best horse racing events. In 2011 I journeyed to Sligo Racetrack in Southern Ireland. 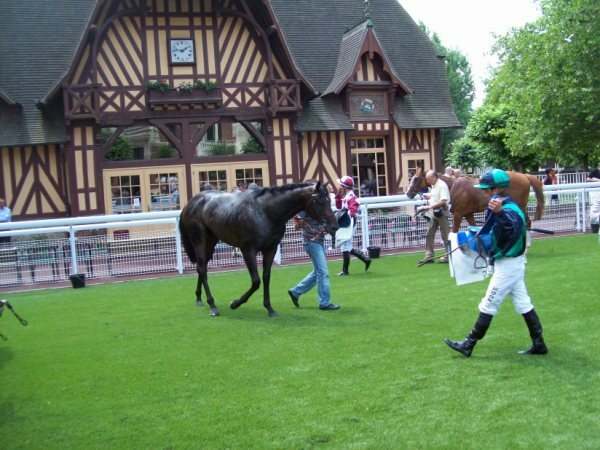 Deauville is a glorious course situated near the centre of Deauville, constructed in 1862 by Charles Auguste Louis Joseph, duc de Morny, the half brother of Louis Napoleon Bonaparte. 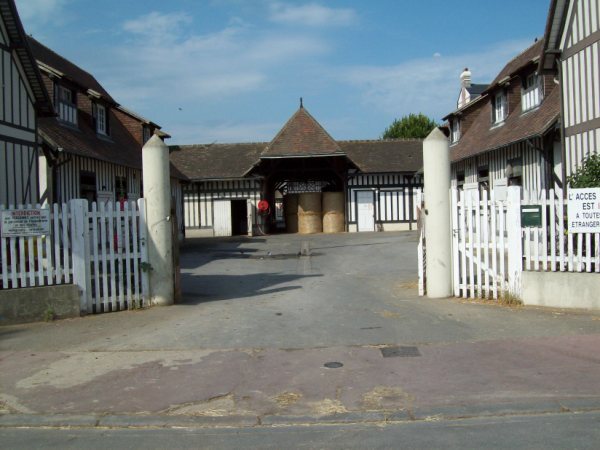 It is all kept in immaculate and pristine condition and even the stable blocks exude Olde Worlde charm. I visited with my sister, Sarah and on arriving by car from Caen along the coast road we stopped at the Tourist office for directions to the race track. To our surprise we were offered free entry tickets so I recommend you do the same to avoid paying (admittedly only a few Euros) to get in. This was in early July so when the season gets into full swing the free entry may not be available. * Round Outdoor turf Track: 2200m righthanded. * Round Indoor synthetic Track 2000m righthanded. The Weighing Room is a large attractive free standing building behind the Parade Ring / winners enclosure. The parade ring is easily accessible to all and there are seats on a low bank to watch the horses walk round. The horse (which we backed) went on to win his race and is pictured here. The toilets are situated in this building and are clean, airy and well appointed. Having placed your bets you move out through the building to the standsoverlooking the race-tracks from which you have a good view of the entire race track. Direct connection from Paris Saint-Lazare to Deauville-Trouville, multiple round trips per day, click here to obtain the schedules and fares or to make an online reservation. * Possibility to rent spaces by the day or season. 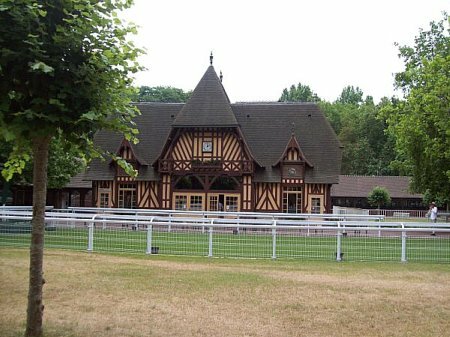 * A panoramic restaurant "La Toque"
* A brewery "The Paddock Gardens"
* Snack bar "The Stud"
* A bar "The gowns. This Deauville condo property is located near Deauville La Touques Racecourse and Plage Deauville. Another nearby point of interest is Trouville Beach.